1470 fps with a 40 grain bullet. Normal High Velocity 22LR ammo goes about 1250 fps with a 40 gr bullet. Usually the faster ammo uses a lighter bullet to do it: (For example, the hyper velocity CCI Stinger uses a 32 gr bullet and goes 1640 fps.) So, the Aguila Interceptor delivers the hard impact of the heavier 40 grain bullet at a velocity almost as high as Stinger... This could be the combination of knock down and trajectory the suits your rifle perfectly... Order a box and see how it works in your rifle! they are ok. work fine as long as your gun is in good shape. These are great rounds. Quick and accurate. Just wish they were hollow point rounds. 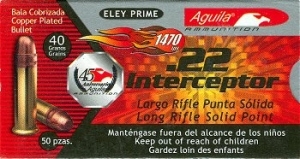 the Aguila interceptor 22s are a very accurate round. I wasn't wild about the cost but you pay for what isn't on most store shelves. I'll be getting more when I run out. Again, accurate and dependable round.